Argonne Road Safeway store to close? Safeway's corporate customer service department won't say that it is true or not, but we've been told from a couple of in the know sources that a Spokane Valley Safeway store will close it's doors soon. The store in question is the Safeway at 1441 N. Argonne Rd. just south of I-90. We're told that store's lease is up soon and they have chosen not to renew due to slowing sales. Some, if not all employees of the store will be able to take open positions at other Spokane area Safeway stores. If my news is correct, the Argonne Rd. Safeway store will have it's last day in March. The mystery tenant that will replace the current Mobius Science Center space has been leaked. Today, River Park Square's 809 Lofts LLC put in for a building permit to begin tenant improvements for Anthropologie . There are no files attached to the building permit record, and it is only pending as of my writing this, so no construction activity is expected immediately, but surely will come soon. The space is actually across the street from River Park Square at 811 W. Main Ave. and Mobius is actually still open for business at the space. However it was confirmed earlier that they will move out in March, to temporary space on the third floor of the Downtown Public Library building. A lot of people have been searching, and asking me what is going in behind the new Bruchi's, in the 6700 block of N. Division ( 6720 N. Division, to be exact ). Well, in case you don't know yet. 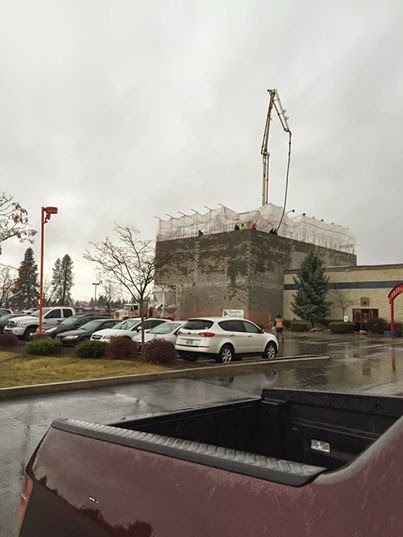 This large building is being remodeled for a new location of the Sportsman's Warehouse chain, based in Utah. This new location marks a re-entry into the Spokane market after the chain sold area stores to Canadian based Wholesale Sports, who in turn went out of business in the local area. At one time Sportsman's Warehouse operated locations at Northtown Mall and on E. Indiana Ave in Spokane Valley. This new North Spokane Sportsman's Warehouse will be take all of the almost 40,000 square foot building. They will also employ about 60 - 70 associates. And, when will the new store open for business? Turns out, this new store isn't far away from opening their doors to the public. We have found out that the store is scheduled to have a soft opening on Feb. 26th and a grand opening celebration to follow on Mar. 7th .
" 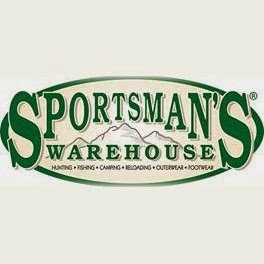 Sportsman’s Warehouse serves outdoor enthusiasts, casual users and first time participants with quality brand-name hunting, fishing, and camping merchandise within a convenient shopping environment "
An exciting, new event is coming to the Lilac City this Summer. And while they'll only be in town for a limited amount of time, it promises to a big event. A travelling business called Slide The City travels around the nation each year with their massive 1,000 foot long slip n' slide style ride. The ride is usually set up on public city streets with an admission charge for each slider. 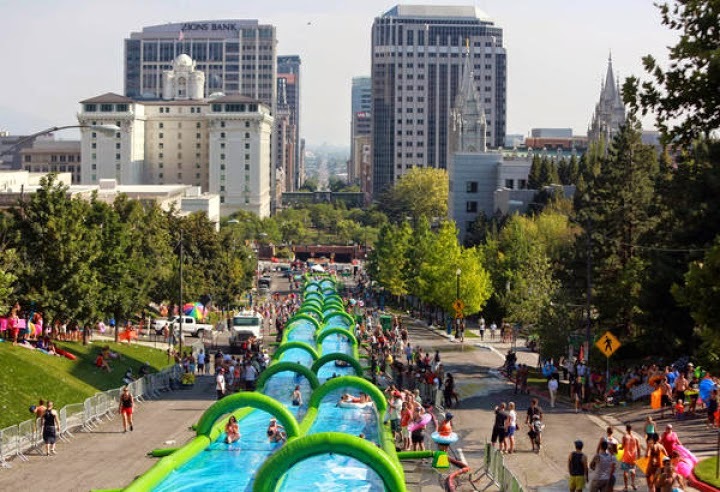 This year, that company, Slide The City will be stopping here in Spokane. The local event will be on Saturday July 18th 2015 at a yet to be determined local location . Pricing to slide on the Slide The City slide varies and starts at $15.00 for a single person , single slide. Discounts are given for a "triple slide" which gives riders three slides. A VIP slide package is also available. Customers with the VIP slide will be allowed to slide on the slide an hour before and after the slide is open. The West Central neighborhood's anchor coffee shop, Indaba Coffee, will expand there reach soon with a new second location in the heart of Downtown Spokane. The original location, which can be found at 1425 W. Broadway will remain open. And, the new location will open in the coming weeks / months in a first floor storefront in the Bennett Block building, corner of Main and Howard . The new Downtown Indaba Coffee will take a small space in between Mizuna and the former Spokane Exercise Equipment store.
" We will be offering several coffee options for your espresso or pour over coffee. We also have some fun surprises for those really into specialty coffee. As we continue to pioneer specialty coffee in Spokane, people can expect to find unique coffee cocktails, spectacular hospitality, and the usual amazing cup of coffee. " Those of you following along with my blog may remember me sharing renderings of what the completed Grand Hotel Spokane ( 333 W. Spokane Falls Blvd. ) will look like. 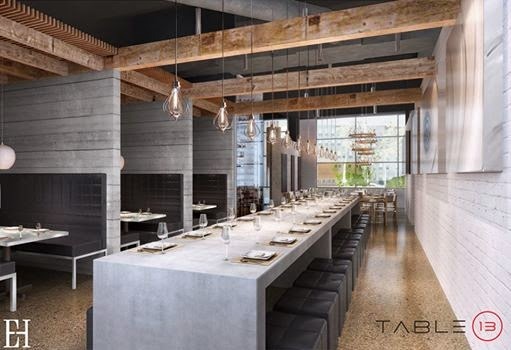 At, that time I also shared a rendering of a new restaurant coming to Spokane called Table 13 which I had assumed would be in the hotel. 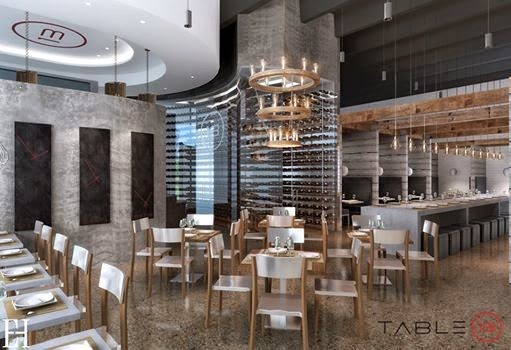 And, I have now confirmed that, Table 13 will in fact be a new restaurant planned to open within the new hotel tower. Likely on the first floor. There is no word on a menu or employment figures, but we can assume this will be the upscale Italian restaurant we had heard was planned to be in the hotel. This is because Table 13 is modeled after developer Walt Worthy's favorite Italian restaurant in Palm Beach,Fla. In addition to this confirmation of Table 13 opening at the Grand Hotel Spokane. We also recently found out rooms at the new hotel are now bookable via the Marriott web site at www.marriott.com . The Grand Hotel, along with sister hotel's The Davenport and Hotel Lusso are all part of the Marriott system but under a special branding for unique and/ or historic upscale hotels. Room reservations on the Marriott web site is only available when booking in at least June 2015. Room prices will vary but appear to be quite comparable to other mid to upscale hotels in Spokane. We, have also heard the Grand Hotel will also have a Starbucks Coffee location, this part however has not yet been confirmed. Opening late last year is Sprocket Sport, a new motocross / dirt bike / ATV dealership in North Spokane. The business is located at 1819 E. Francis Ave. The new business includes both bike sales and service. Eyeguys Optical has expanded by opening a new location over the Idaho / Washington border in Spokane Valley also late last year. They also will continue to operate the original Eyeguys location in Hayden on Cornerstone Dr. . This new Spokane Valley Eyeguys Optical is a full optometry office with an on site doctor and frame / contact sales and service. The clinic is headed up by Dr. Anthony Lopez. And, in a reverse move of Eyeguys, The Spokane based Northtown Insurance will open a new agency location soon in Hayden. This new office will open next month at 279 W. Prairie Shopping Center in the Prairie Crossing Shopping Center. 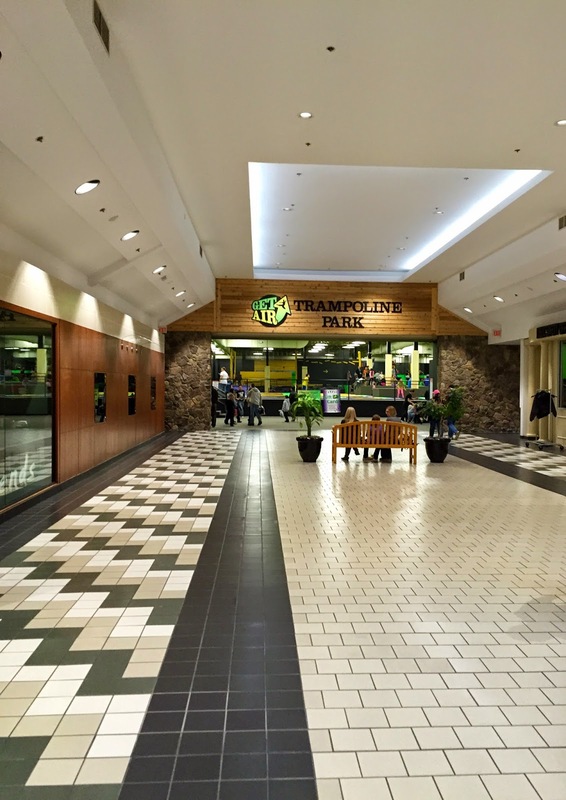 Additionally Northtown also operates locations in North Spokane ( by Northtown Mall ) , Spokane Valley ( inside of Spokane Valley Mall ) and Lake Stevens,Wa. A new flight school called Latitude Aviation is now open for business at the Coeur d' Alene / Pappy Boyington Field Airport in Hayden. Malloy, a supplier of safety products has set up shop in 5,000 square feet of space at the Spokane Business & Industrial Park's building 100. The Park is located at 3808 N. Sullivan Road in Spokane Valley. The clinic which is called OSI for short officially opened in Spokane on Jan 5th and can be found at 26 E. 5th Ave by the Division / 5th Ave intersection. Also, the Coeur d' Alene clinic location is still in business at 1875 N. Lakewood Suite 200. OSI offers specialists for knees, hand / wrist / forearm and sports medicine. A new street wear clothing store in now open in Downtown Spokane. The business has a unique name and great location at 920 W. 1st Ave. in the same building as The Knitting Factory concert house. Good x Cmpny sells everything from shirts / pants, etc... to accessories like hats. The Spokane branch of School Employees Credit Union of Washington will move to a space in Spokane Valley. 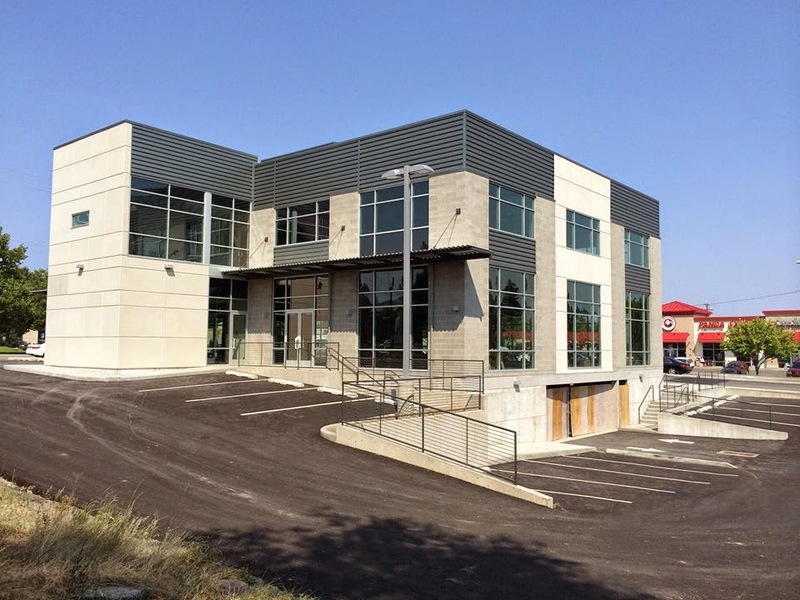 The credit union will occupy for first and third floors of the building at 5123 E. Third Ave. This new branch will replace their current location and will be much bigger then the current Spokane office. The Downtown Spokane location of Mechanic's Pride Tire & Automotive will reopen soon in a new home. The business is being bumped out of their current location on W. 3rd Ave. to make way for the expansion of Larry H. Miller Lexus. The business will move into what was formerly Rohrer's Select Cars at 1126 W. Second. The new location will be bigger then the original and still keeping with all of the same services offered at the location on 3rd. Mechanic's Pride's location in Spokane Valley remains open and operating out of the same location as before, 523 N. Pines Rd. R.I.P Chad "cheddar" Rattray . Chad was the owner and operator of the popular, long running hot dog cart out front of the Bank of America building Downtown. In case you missed the media coverage, he unfortunately passed away last week of the flu. His cart will surely be missed by all Downtown workers / visitors and myself. My thoughts go out to his friends and family. Among my favorite coffee shops in the Inland Northwest is The Wake Up Call, with a small group of locations around Spokane Valley. Now the small chain coming in closer to Downtown with last week's opening of their newest location. The new Wake Up Call can be found at the corner of 5th and Freya ( 3526 E. 5th Ave. ) . This is nearby the Thor Ave. Fred Meyer store. A new bakery from the same ownership / chef of Sante will open for business sometime this week. The bakery is called Common Crumb Artisan Bakery and will be at 19 W. Main in Downtown Spokane's new Saranac Commons building. We hope to have more on Common Crumb soon. Also, a grand opening is planned, probably in March or April once the other Saranac Commons businesses come on line. With early excellent reviews coming in, it's hard to ignore one of the newest Mexican restaurants in Spokane. Maracas Mexican Grill opened late last year in a former Asian restaurant space on the South Hill. Maracas can be found at 2910 E. 57th Ave. Suite 4 and is locally owned and operated with beer / wine and a full bar available. Billed as a family drive in , Stop n' Go Drive In has gone out of business. The local fast food restaurant at one time had a location in North Spokane and Spokane Valley. The last location, which was at 6325 N. Wall in North Spokane is now closed. While it opened later then everyone expected, Tamarack Public House is now open in Downtown Spokane. Tamarack Public House is pub with a full, and exciting food menu. They can be found by the Bing Crosby Theater at 912 W. Sprague Ave. The established, Spokane Valley based Latah Creek Winery has opened a new wine tasting room in Downtown Spokane, adding to the up and coming Downtown wine scene ( Spokane Cork District ). The new Latah Creek Winery tasting room is located in the same space as Bozzi Gallery, a art gallery on the second floor of the Old City Hall building at 221 N. Wall. This is note worthy to local wine lovers as Arbor Crest Winery recently left River Park Square and this new wine tasting room is actually accessible from River Park Square via the hallway in between Macy's and Smart Smoke. With only two food trucks it's far from a full fledged food truck pod, but in a city that has only a few food trucks it is worth mention of the new guys on N. Government Way. Dj's Adventures in Deliciousness - a burger truck, that also features mac n' cheese bacon balls. Drummin Up BBQ - a BBQ food truck. Telect, which is a manufacturer of fiber optic and communication equipment that had plants in Mexico and Plano,Texas , recently announced it's intention to close the Texas plant. With the plant closure they will move a portion of it's work here to a new facility in Liberty Lake. The new Liberty Lake Telect plant will have fewer employees then the Plano plant had, but still will create a lot of new local jobs. The new Liberty Lake Telect plant will employ about 60 in the plant alone to start, and will include space for new HQ offices allowing both office and manufacturing staff to all be under the same roof once again. The company will leave their current office building on Knox Ave. in Liberty Lake in Feb. / March . The new operations will be in a currently vacant space at the Liberty Lake Business Park at 22425 E. Appleway. This is the large complex of white buildings near the corner of Appleway and Liberty Lake Road, just off of I-90. There is also speculation that Telect's move into the park may bring new life to that site which has struggled in recent years. Currently, there are no businesses at the park, although Vivint did operate a call center in the park for about a year before closing and leaving the local area altogether. Telect will take about 60,000 square feet there, with a rumored new call center to also be close to leasing space there as well. If the new call center does happen, then the complexes restaurant space may also be re-filled. That space was last used when Safeco Insurance was at the building, but with Safeco's relocation to the Meadowwood complex, the restaurant moved also, and is now in business at Meadowwood as Eat Good. Telect has already started the process of moving into the Liberty Lake Business Park space will operations expected to be fully geared up sometime this spring. Will 2015 be the year of change for River Park Square? River Park Square already has some business changes happening. Whiz Kids, a education toy / gift shop, which had been on the third floor has now moved to a new, newly remodeled and bigger space on the second floor by the entry to Nordstrom. Additionally the mall has other retail vacancies which will likely not stay empty for too long after the weather starts to warm back up. Wall Street to be vacated for a new retail tenant? This is not set in stone and is currently up for discussion by Spokane City Council. A mystery national retailer is said to be interested in opening on the east side of River Park Square. But as a stipulation of their opening they would need to take about 17 feet of right away on N. Wall St. This is controversial because Spokane Transit has been in discussion also of using that same right of way for a central city transit line. As of today no decision has been made. And it is assumed this new business would take over the neighboring former T-Mobile space and maybe even the former art/ gift business space that is on the second floor over top of the former T-Mobile. If anyone has tips on who this mystery national retailer may be, please e-mail INBW HQ at inlandbusiness@yahoo.com . You can remain anonymous . To our knowledge the Mobius Children's Museum in River Park Square basement will stay and remain in business. But the Mobius Science Center, technically across the street at 809 W. Main, but still on River Park Square's property will be moving out. This is due River Park Square's management supposedly having a new national tenant wanting to locate in the same, prime Downtown space. Again, River Park Square will not say who this business is. However, early speculation is Whole Foods, but that is only speculation and may or may not be correct. If anyone would like to give an anonymous tip contact me at inlandbusiness@yahoo.com . And rest assured, Mobius Science Center is not closing. Mobius will move to a small temporary space in the Downtown Public Library building. Very close by River Park Square. This move is only temporary as Mobius will soon move into the Post St. Substation building, which is being donated to Mobius by Avista. But, because of Avista's non public uses of the historic landmark building, extensive remodeling must be done before Mobius can move in. Currently Mobius is thought to be moving in there around the end of 2015. Mobius will at first use only first floor there, with all floors being available to them in the months after then initially occupancy. It's not an official plan, more just one local man's idea. But the blogger behind The #Spokanerising Project ( https://spokanerising.wordpress.com/ ) came up recently with an idea to turn Main Ave. by River Park Square into a car less pedestrian mall. Grocery stores and restaurants in Spokane and around the nation alike have been gradually adding foods for those with food allergies. Many places now give a gluten free option, but for diabetics , sugar free foods options can be a little more hand to find. But soon, a new business in Spokane Valley will open to help out. The new business will be a diabetic friendly grocery store called Not So Sweet . The store is currently scheduled to open in late winter / early spring of this year. The store will be small with a little more then 3,000 square feet of space at 302 S. Pines Rd., a couple of blocks south of the Pines / Sprague intersection in Spokane Valley. The store will employ 5 and carry many low or no sugar specialty grocery items. No meat or produce section will be available due to space, but a frozen food section will be in the store. In addition, Not So Sweet will also carry gluten free items as well. Currently Not So Sweet has no online presence ( web site or social media ) but we will update if and when they do. Recently signs went up at a site in Spokane Valley for a new Homegoods store that is coming soon. This will be the first Homegoods location in Spokane market and we have confirmed it with the chain's corporate customer service department. Only downside is not all of our questions got answered. What we do know is that this new store will open in September and will be just down the street from Spokane Valley Mall. The sign is actually located at the corner of Indiana and Sullivan leading us to assume the new store will go into the now vacant former Staples stores in the shopping center at that corner. The answers we didn't get answered we're store size and how many jobs might be created by this store. Watch for updates as we get them. Homegoods is a chain mid box store owned and operated by TJX,Inc. who also operates TJ Maxx and Marshall's , clothing chain stores that already have locations in the Spokane area. Unlike TJ Maxx and Marshall's however Homegoods is more on the home décor side with bedding, furniture and other houseware merchandise. The chain currently operates over 400 stores with many more coming. I can usually get an idea of how popular some new local businesses are by how many web searches bring them to my web site. And, lately one of the top search terms has been of a new anchor business in Northtown Mall. That business is Get Air and it opened late last year in the former Wholesale Sports store space on the south east side of the mall. Get Air is just one location of a chain " trampoline park " type businesses that even includes a location in the Tri-Cities. The locations are franchised, but the Spokane location is not the same franchise owner as in Kennewick. Get Air Trampoline Park is fun for all ages and has many features. Get Air offers trampoline bouncing, slack line , foam pit a fidget ladder and much more. They also welcome birthday parities with online booking available. Last year, Catholic Charities , opened a furniture store in a small but historic storefront on N. Monroe St. in Spokane. That store was created to help people establish households and to earn funding for the non profit organizations many other programs that assist Spokane's less then fortunate. And now that store, which is called Furnishings for Hope, has been relocated and is in a much larger location. Furnishings for Hope is now open at 917 E. Trent Ave by the URM Cash & Carry store ( Corner of Trent and Hamilton ). And, along with the new larger store space comes even more great furniture finds. The Monroe St. location is now closed but this new store on Trent is over three times as large as the original location. The new store fills about 7,000 square feet of space and also is by the Catholic Charities Furniture Bank . Furnishings for Hope carries all kinds of second hand furniture from chairs , bedroom sets , wood furniture and much much more. And with the second hand format of the store the inventory changes regularly. Looks like the concept of painting classes with wine and beer being served is coming to Coeur d' Alene. The concept was brought to the Inland Northwest by Pinot's Palette in Spokane just last year. Now, a new similar but unrealated shop is in the process of coming to Riverstone in Coeur d' Alene. The business will be called The Paint Buzz and will occupy the storefront at 2145 N Main near The Culinary Stone kitchen/ gourmet grocery store. A web site is also coming. Have fun while learning to acrylic paint on canvas and take home your masterpiece! No experience required! Enjoy a few drinks from our beer and wine bar! Shop for local artists work on display in our retail section! Listen to music, and enjoy the beautiful views of the mountains and lakes in River StoneVillage in CDA! It's as much fun as a night out at the movies or even dinner! And only costs $30 each! Call for group bookings too! And if you know a charity who can benefit from a fundraiser, give us a call! Booking private Parties as soon as we open! The Paint Buzz will be open in March/April! We will be posting our paint calendar soon and you can book classes online for date nights, live music nights, girls nights, or genre music nights! The Paint Buzz is also an event center with beer/wine bar services for your event! Complete with a stage, PA system, with a large space! Going out of business sales are already underway at a longtime national mall merchant that also operates in two Spokane malls. That business is Deb Shops, a teen and young adult women's clothing store that will close it's doors in the Spring. Each store will remain in operation till all inventory is sold but there are not set closing dates as of today. Spokane Valley Mall , Second floor eastern end (PH: 509-892-1245 ). Northtown Mall, First floor northern end by Christopher & Banks ( PH: 509-484-5957 ) . Deb Shops is a Phildelphia based chain which is closing after filing for bankruptcy last year. Store fixtures and equipment will also be available for sale soon if not already. Contact the individual stores for more information. Mitchell Artist Management is a Coeur d' Alene based company that not everyone even knows about, but they should. Mitchell Artist Management or MAM is fast growing talent management firm that has over 200 very talented artists available. Sometime ago, I posted to this site of the potential for a Buffalo Wild Wings restaurant to come to Northtown Mall. Since then several alert readers have e-mailed me seeing that the restaurant chain has begun posting for employment at a new location in North Spokane. This led me to do a little research. 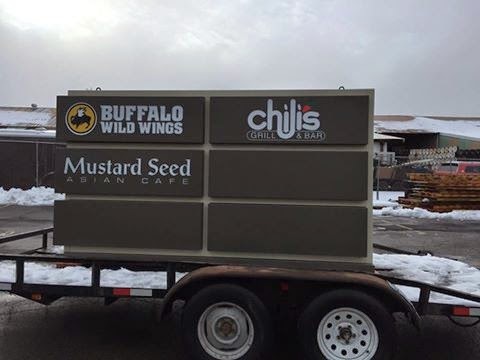 And, now I can confirm that North Spokane will be getting a Buffalo Wild Wings and that new location will be within Northtown Mall. Notice the Buffalo Wild Wings logo in the upper right corner. Between this and the fact that people are finding job posting we can only assume this new restaurant can't be to far out. The new restaurant will be part of the newly reconstructed north corridor of the mall. Northtown Mall's management also promises other exciting new restaurants and coffee shop / internet café to also open soon in this newly created space. If the plans filed with the City of Spokane are any indication, the new restaurant will be about 5,000 square feet making it smaller then the Spokane Valley location. Buffalo Wild Wings only recently expanded to the Spokane market opening first in Spokane Valley, then Coeur d' Alene just last year. The chain is also planning to open in the Tri-Cities in 2015. The new Buffalo Wild Wings should open sometime in June and will employ around 130. Gerber Collision & Glass , a Chicago based chain of auto body shops has opened it's first location in Idaho with the recent take over of a local auto body shop in Coeur d' Alene. "Chicago, Illinois - November 4, 2014 - The Boyd Group Inc. (the "Boyd Group") today announced the opening of a collision repair location in Coeur d'Alene, Idaho. The location has approximately 13,500 square feet of production space and previously operated under the name Lake City Auto Body. "We continue our North American expansion with the opening of this new repair center and are very pleased to increase our footprint in the greater Spokane area. With this new center, we have the opportunity to introduce our high quality brand to a large base of new customers, while continuing to improve our platform for our insurance partners" said Tim O'Day, President and COO of the Boyd Group's U.S. operations. "Our first Idaho center has the benefit of being well-positioned, within about 30 miles east of our Spokane center, which will allow our Washington leadership team to manage the location." "Coeur d'Alene, also known as Lake City, has a year-round tourism industry due to the mountains and lakes that surround it, which will allow us to introduce our brand to all who may require our services when they visit here," Mr. O'Day added. "We look forward to providing the Idaho market with the high quality experience we are known for at all our Gerber repair centers." "
Gerber Collision & Glass is a division of Boyd Group which operates Gerber Collision & Glass locations in 17 US states and Boyd Auto Body & Glass in Canada. Gerber Collision & Glass also already has locations in Spokane. It's orginal location is at 1627 E. Francis Ave. and a new location that opened just last year in Downtown Spokane at 1318 W. 2nd Ave.
New dining options are coming to space on the third floor of River Park Square. We actually mentioned this a couple of months back with a building permit was issued and now we know exactly what " holeshot " is. Holeshot will be a brand new pizza restaurant planned to open in the former Pizza Oven space in River Park Square's food court. Holeshot will cook pizzas in brick oven with whole pizza and pizza by the slice. The restaurant will have a motocross theme. In addition to the new pizza restaurant business owner , Kevin McRae , will also open a beer and wine bar next door on the third floor of the mall called, The First Turn . The First Turn will take some of the space that was last the Arbor Crest Winery tasting room. The Arbor Crest tasting room closed at the end of 2014 and consolidated with their main Winery in Spokane Valley. They, however have indicated they may open elsewhere in Downtown Spokane sometime in the next year to year and a half. Together Holeshot Pizza Restaurant and The First Turn will open sometime in the Spring. If you haven't heard by now, Nectar Tasting Room, a Downtown Spokane wine tasting / event space is branching out. In the last quarter of 2014, Nectar came out with the announcement of a new spin off retail store/ tasting space called Nectar Wine & Beer. Nectar Wine & Beer will be located in Kendall Yards at 1331 W. Summit Pkwy, in a storefront space directly next to the new Veraci Pizza restaurant. Info on the new business itself can be found in the link at the bottom of this blog post. And, even more exciting then just the fact that Nectar Wine & Beer is coming is the recent news that construction work is officially underway on this new store. The work is being done by local contraction JNW Builders with design work also done locally by HDG Design Group. While the building has been standing since last Summer, tenant improvement work is just now being wrapped up on one the South Hill's newest multi use buildings. That building is the "2420 Building" named so because of it's address at 2420 E. 29th Ave. is now open . The building is available to retail on the ground floor and office space above. In all the new building provides about 20,000 square feet of space with one business already set to open at the 2420. That tenant is said to be Dr. Scott Ralph, a locally based Orthodontist. The building is on the high traffic corner of 29th and Southeast Blvd. and is only a few blocks to the west of the Lincoln Heights Shopping Center, home to Trader Joe's . The Spokane based Etailz,Inc. has a major online shopping presence with websites like www.greencupboards.com and a few others. But late last year the company took the next step and established a brick and mortar retail store here in Spokane. That store is, Wollnick's and has operated in Spokane's Perry District for a little more then a year. The store which sells sustainable gifts, home goods and more has gathered a following in it's relatively small, but new, space. But now Wollnick's and it's parent Etailz,Inc. are moving on up yet again. Wollnick's has closed down it's Perry St. store and will open as soon as Mid-January in Downtown Spokane. The store will take the prime space at 421 W. Main, a section of the former Happin's store. The new store space will be much larger then the original store with more then triple the space. In addition to the size of the store, the new location also has location on it's side. The new store is one of many new businesses in the block following a couple of recent building renovations. And on top of that, it is within walking distance of River Park Square and the new Grand Hotel Spokane. Vault will be an electronics store that will take a portion of the space on W. Main . The store will carry a good sized inventory of electronic accessories and similar. Coy Beauty will be a beauty supply store and will be located within newly renovated retail space in the Bickett Building. The store's address will be 227 W. Riverside. All three of the company's stores will carry much of the same inventory as on their web sites. Likely all will be opening within the first months of 2015. The above photo is of the expansion work already well underway on the western side of Triple Play Family Fun Park in Hayden. The project will add about 8,750 square feet of new space onto the mixed attraction park, that is also home to Raptor Reef Indoor Water Park and a Holiday Inn Express hotel. The new section will be home to a 3,600 square foot LED illuminated laser tag arena and a ropes course. The new ropes course will stand 32 feet tall with 3 stories. The new laser tag arena will replace a smaller laser tag section already at the attraction center. The new expansion will open to the public within the first couple of months of 2015.